Santa is waiting for you! Well, in this game you are going to help him get his home. So, if you wanna to do it, then just match the same gifts and they will disappear. 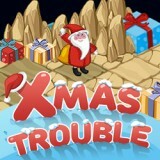 Collect candies and coins. We know that you can cope with it. Just have much fun.